The Brother Designio Series DZ2400 sewing and quilting machine is an excellent machine -- particularly for clothes making and quilting. It sews well, has a generous work area and plenty of stitch versatility. There are a few niggles -- it's not always intuitive and the monogramming is poor -- but it's hard to argue with that great price. The Brother Designio Series DZ2400 Computerized Sewing and Quilting Machine is designed for people who want to play with design and stand out with the projects they create. It sews smoothly and evenly, and it is really well suited for regular use. It comes with a lot of bells and whistles that are likely to appeal to more experienced sewers — especially if you love clothes making and quilting. However, the monogramming isn’t totally up to scratch and some features aren’t the most intuitive. We still consider it a great machine for the price, however. The Brother Designio DZ2400 has a sleek but simple design to. It is not too flashy, so it would complement the decor of most sewing and crafting rooms. It weighs in at just under 20 pounds, so is pretty sturdy and stable. Because it comes with an oversized table area, you should plan to have a good amount of desk space for this model. The table itself is a bit more practical than decorative, but it really is a valuable addition in terms of functionality. Stitches: 185 built-in stitches: 130 sewing stitches and 55 alphanumeric stitches. It also includes 8 styles of 1-step buttonholes, which will be automatically sized. Brother has become a household name for sewing machines and home office products. They have a long standing reputation, they were founded almost 120 years ago and have had a headquarters established in the United States since 1954. They also create home office and business products like laserjet and all-in-one printers. They are known for their dedication to quality and for their strong reputation in the sewing machine, office, and home office industries. Brother has a fairly standard warranty for their machines. The Brother Designio Series DZ2400 computerized sewing and quilting machine comes with a limited 25 year warranty. Specifically, “limited” means that you get a one year warranty on parts, labor, and accessories, and two year warranty on electrical components and printed circuit boards. The chassis is under warranty for up to 25 years. You will want to hold onto your receipt, if you plan to benefit from the warranty. Brother requires proof of purchase for any warranty claims, and the dates your warranty covers your machine are based upon your date of purchase. If you are looking to up your game when it comes to sewing, the Brother Designio Series DZ2400 has a lot of features that can help you do just that. In terms of stitches, this machine has a lot to offer. It comes with 130 sewing stitch options and 55 alphanumeric stitches for monogramming. The sewing stitches offer you a wide variety of decorative options. If you are sewing a dress or a shirt, you can add a bit of flare to the hem by finishing it with one of these decorative designs. The monogramming options are nice, but they may leave a little bit to be desired. 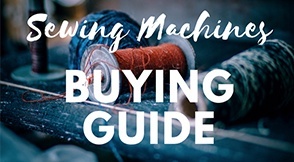 The option to choose from so many different styles of buttonholes shows that this machine made for sewers who want to take their design skills to the next level. Each of the 1-step buttonhole designs look crisp and fashionable. This is a great machine for aspiring clothes makers. This feature is really perfect for sewers who want control over the speed of their stitches. You can move the stitch speed slide lever to change the pace, going from fast to slow with just one touch. Threading the needle on a sewing machine can be difficult, but the advanced threading system is built to do that work for you. Pressing the lever on the side of the machine should push the thread right into the needle’s eye, so you can start sewing. This is a great feature, but it can be a little tricky to figure out. The display is a decent size on this model, so it makes reading the screen quite simple. It also clearly displays which stitch you have selected, and what foot is needed for that stitch. Another feature that makes the Brother DZ2400 machine ideally suited to clothes makers and quilters is the huge work area and the extra wide table included. This makes it really perfect for large projects — quilts, dresses and the like. Like with all of the new Brother sewing machines, this Designio Series is blessed with a top-load drop-in bobbin that stays in place and helps to promote even stitching. Not quite the automatic needle threader that we expect to see on most sewing machines for beginners, but the Advanced Easy Needle Threading System of the DZ2400 tries to make that ever-fiddly needle threading a much easier maneuver. In theory, it just requires a push of the lever on the side of the machine — although it took us a few goes to get used to it. You can get started easily with this sewing and quilting machine — no need to master the foot pedal! If you’re not buying the Brother DZ2400 for either quilting or clothes making, then you won’t be making full use of it. It is perfectly designed for these hobbies. The huge workspace is honestly one of the best features it has to offer. Many sewers find themselves frustrated when they try to bridge the gap between their sewing machine and their sewing table. The oversized table on this model helps ease that frustration; it makes larger projects, like dresses, quilts, and costumes, much more maneuverable. Plus, with such an abundance of in-built stitches and buttonholes, the world is really your oyster when it comes to design. Experience can be key with this sewing machine, but even experienced sewers may not know everything about what feet are needed for a specific stitch, and the Brother DZ2400 has you covered in that regard. When you select a stitch, the LCD display tells you what foot is needed for the stitch you want, which takes out any guesswork. This is also great for beginners, who will start to see their skills grow with the machine — instead of relying on guesswork and YouTube tutorials. We were surprised by the high quality of the stitching considering the Designio Series’ low price point, but we found it to be even with no jamming or skipped stitches. It can’t really compare to some of the highest quality machines in the market, but it still goes far and beyond entry level and beginner sewing machines. We’ve mentioned how great the Brother DZ2400 is for clothes making and quilting, but it can actually do far more than that. With a whopping 185 in-built stitches, you can really do a lot with this machine. Again — much more than you’d expect for a sewing machine of this price. Our favorite sewing machines are invariably those that come equipped with a swathe of accessories, when there’s no need to buy anything extra to get started. This is the way with the Brother Designio Series DZ2400 — it’s all there in the box. Time to get started! Threading the machine can be a little complicated and the automatic-threader is not necessarily intuitive. You will want to watch the instructional DVD, so you know how to thread the machine and how to use the needle threader correctly. That’s not to say it’s particularly difficult — but it may take you a few tries to truly master. Monogramming is often added to computerized sewing machines because it can make the machine a more attractive purchase. If you are looking for a machine with really good monogramming, this is probably not the right one for you. The letters are fairly small, only about a ¼ of an inch in size, and there is no real option to increase the lettering size. There’s also only one option in terms of font for these letters, which is fairly limiting. A shame, but you can’t have it all at this price point! Brother advertize the DZ2400 as having a super bright work area, but we found the LED lights a little lacking in power — especially given the wide work area. You may need to supplement with a sewing or desk lamp if you’re in a dimly lit room. Overall, we were really impressed with the Brother Designio Series DZ2400 sewing and quilting machine. It really stands out as a quality machine for clothes making and quilting, with a super large work area and an impressive range of stitches and buttonholes. There are a couple of niggles — it’s not great for monogramming, for one — but, all in all, it’s a cracking machine considering its reasonable price. This is one of the most popular sewing and quilting machines on the market, so you can find it it plenty of stores both online and in person. And, of course, it’s available on Amazon. Have you tried the Brother Designio Series DZ2400 sewing machine yet? Welcome to our sewing machines review portal. Our experts have spent hours road-testing and exploring the best (and worst!) sewing machines on the market. We’ve got reviews from all the most popular brands including Singer, Brother, Juki, and Janome. You can also search our archives by specific criteria such as the best machines for kids, beginners, embroidery, quilting, everyday use and more.